We can repair or replace individual sections of sash & most types of wooden windows. Instead of condemning a window because of a bit of rot, why not ask us first if it can be repaired. A lot of people don't realize how easy & cost effectively rotten windows & doors can be repaired. We can replace broken panes of glass very quickly & easily with no fuss or mess and no waiting for the putty to cure before painting. The new glass is installed using an epoxy filler which sets within minutes, enabling us to paint over it immediately. * Did you Know ? We can also replace standard glass with toughened or double glazed units. Choose from a massive range of individual pattern collections and unique wallcoverings available for viewing in the comfort of your own home, including designs from Sandersons, Harlequin and other leading manufacturers. 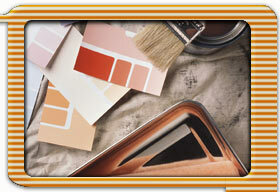 With our colour matching service we can match almost any colour you like.